So I created a fake fireplace, with a capacious mantelpiece (a mobile mantelpiece, Mills’ Mobile Mantelpiece) and supplied it with a goodly selection of the finest charity shop miniatures I could find in a couple of hours of hunting. I then invited the visiting public to arrange these objects on the mantelpiece as they wished, and if possible to take a photo with their phone or camera and email or text it to me. 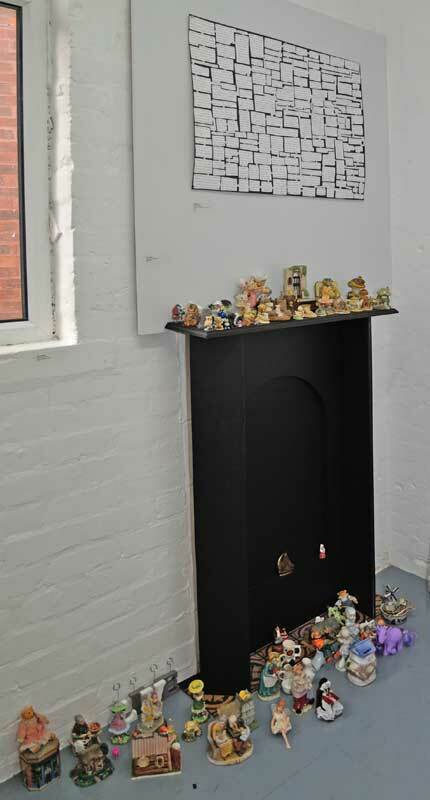 My mantelpiece was fun to create and to populate. I spent a happy and strange Saturday in the exhibition, watching people peer, some perhaps uncomprehendingly, others amusedly, some with interest, others cursorily, at my work. I enjoyed talking with visitors, trying to get them to overcome their reluctance to touch. So far I have only a handful of results, though they are all interesting and relevant. A number of visitors are unable to overcome their reservations and feel free to grab objects and play with them – perhaps it’s not something we are accustomed to doing in a gallery space. But I expect that by the end of the six day exhibition (six saturdays) I’ll have enough material to add another experience to the “Encounters” section of my research outcome.